Each piece fully hallmarked for Birmingham, 1957, maker's mark B & Co. Boxed weight 1.4kg. Vintage Vanity filigree & Cream Dressing Table Set 4 pieces . Condition is Used Lovely metal filigree on brushes and under glass tray. Marked inside brushes with The Regent and patent number . Dispatched with Royal Mail 2nd Class. Comes with vintage hand decorated perfume atomizer. It's a great piece of history from the golden age of luxury travel. The leather case itself is generally in good condition for its age. It has a few blemishes and one of the corners on the lid has split. Made by Foster & Bailey in Providence, ca 1928. This set comprises hand mirror, hair brush, comb, powder jar, and rouge pot. Mirror glass beveled. The jar and pot are round in clear glass with cut and acid-etched abstract garland and square and canted covers. Consists of the case, mirror, shaving soap, shaving brush, razor, with razor blades, grooming brush. Excellent Edwardian Sterling and shell Dressing Table Set beautifully decorated with Sterling silver inlays. Hallmarked for Birmingham (anchor), Sterling (lion) and letter A for 1925. Length brushes: 23cm, 15.5 cm, 15.5 cm. Sterling Silver, Cut Glass and Guilloche Enamel Dressing Table Set - Antique George V.
A small serving tray or perfect for a dressing table. in good condition no plate rubbing a few minor marks. nice engraving to base. the images give a good idea of condition. Good antique order with age related wear and use marks. see pictures. Vintage 1960's Oral B Model 119 Oral Automatic Oral Hygiene Kit Mint. Appears to be mint. All paper work is present. A great piece of dental care history you can own or use. Ornate filigree handles and detailing. Tray semi-hexagonal with 2 plate glass, lace surround, and filigree handles. Wooden brush bases. 37 x 21 cm. Our vision for hospice care is that everyone should have access to the services they need. These very stylish jars have a certain luminosity to the green glass and although smooth on the outside are ribbed on the inside.They have a very 30's-40's look about them especially the aluminium lids with the round knob which looks as if it's made of a cellulose. The Grooming kits features nail clippers, nail scissors, tweezers, cuticle pusher, and nail file. Our wide range of beautifully unique and presented gifts will leave you spoilt for choice! Daisy Patch. 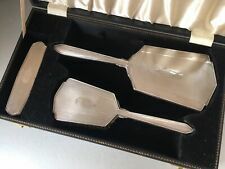 .ENGLISH STERLING SILVER MENS TOILETRY SET MADE TO ORDER, VALUATION 2500 POUNDS. The leatherette case features the family crest to the top of the case. Good clear hallmarks, Birmingham with date letters X Y for 1997 / 98. Set consists of 2 Brushes, Comb, Razor, Soap, Lather & Shaving cream brush. 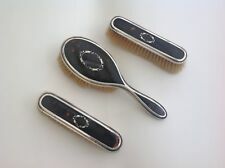 This set comprises 1 hand mirror and 1 hairbrush. Both pieces have tapering handles and are decorated with concentric wave pattern in pink. The mirror has a circular and beveled glass. A pretty pair. Box features black lacquer finish with gilt. Grosgrain fabric interior, velvet lined tray for tools - awl, buttonhook, cork screw, file and penknife. Gallery XV specializes in a variety of art, antiques, jewelry and collectibles. Quality and durability of Marcel Franck atomizers were major considerations. very good condition the Atomizer pump does not work. 18cm x 10cm- jar. I try to describe any obvious faults as truthfully as I can. All pieces hallmarked. Art Deco sterling silver vanity set. Made by Tiffany & Co. in New York. •••••••••••••••••••••••••••• Gallery XV specializes in a variety of art, antiques, jewelry and collectibles. (This item is located in Gardena, CA). We make a best effort to provide a fair and descriptive condition report. There are 2 brushes, the first brush is a ladies hair brush, the second, is either a Gentleman’s HairBrush or a Clothes Brush. These are a fabulous decorative and useable set. These are antique and date to circa 1900. All the three handles are marked 0.800 purity German standard. I try to describe any obvious faults as truthfully as I can. Sterling silver and clear-glass vanity set. Made by T. G. Hawkes & Co. in Corning, New York, ca. 1910. This tray comprises 1 powder jar, 2 rouge pots, and 1 scent bottle, all on tray. 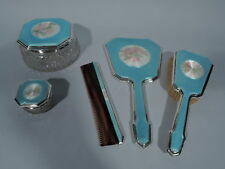 Hawkes Sterling Silver & Cut Glass Vanity Set C 1910. WITH LACE FLORAL CLOCK FACE. MADE IN ENGLAND. Made by Charles S. Green in Birmingham. The set consists of a hand mirror, a hair brush, a comb, a clothes brush, a shoe horn and a button hook, all beautifully made and prettily decorated to the very highest standards. The glass in the mirror has slipped slightly. There are scratches, scuffs and marks. The back of the mirror is scratched. Would benefit from a wipe. As the UK's number one heart charity, the cutting edge research we fund has already made a big difference to people's lives. The cuticle cutter is also made from ebony wood and marked on the side. This is a stunningly rare set of antique handmade ebony wood and sterling silver vanity pieces. The brush is nicely carved by hand and has original genuine quality Russian bristles, as marked on the side. It contains an After Shave Lotion 2.5 fl/oz, a Talcum Powder 2.5 oz. and Soap Bar 8.0z. All are in excellent condition and unused. The soap's plastic wrapping has the complete label but is missing the bottom side of the wrapping.